Are NSAIDs Safe for Cartilage and Health? Following a ketogenic diet will not guarantee weight loss. Producing a lot of ketones does not mean you are shredding body fat. Gulping down shots of olive oil or putting butter in your coffee won’t make you thin. You must consume fewer calories than you need, over time, to lose body fat. Who is this Diet Good For? Ketosis is a metabolic state that occurs when the body does not have enough carbohydrate or total calories for energy. As a result, more fat is burned to fuel the body’s energy demands. As fat (dietary fat from the food you eat or body fat) is used, ketones are formed. When a person is in ketosis, ketones can be used as a source of energy (1). Being in ketosis or producing ketones is not the cause of weight loss. Instead it is the decrease in calories that leads to weight loss. An in depth review of the ketogenic diet can be found here. You use the macronutrients you eat for energy. Eat a high carbohydrate diet and you’ll use more carbohydrates for energy. Eat more fat and you’ll burn more fat (from your high fat diet) for energy. Using fat, from the coconut oil or butter you put your coffee, for energy is totally different than burning the fat on your body for energy. You must be in a caloric deficit for your body to use stored body fat for energy. Let’s say it’s 4 pm and you have eaten 1,000 calories so far today. But your daily needs, without exercise, are 2,300 calories per day. 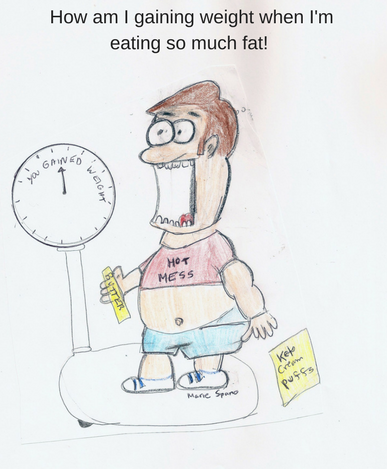 You are now using stored body fat for energy because you are in a calorie deficit (you haven’t eaten enough calories to cover your energy needs). Can you lose weight on a ketogenic diet? Yes absolutely (2). However, from a purely scientific perspective, this is not the best diet for losing fat and maintaining or gaining muscle. Research studies in humans show weight loss from a ketogenic diet is due to water, fat mass and muscle. Additionally, weight loss is likely due, in part, to limited food choices. After all, a stick of butter with drops of flavor and artificial sweeteners mixed in isn’t exactly something most people overeat at dessert time. No bread, rice, pasta, Oreos, Doritos, doughnuts, pizza… the list goes on and on. Another factor contributing to weight loss when on a ketogenic diet, at least for obese people, is a decrease in hunger over the short term. Research also shows on-going professional support is associated with greater weight loss when on a ketogenic diet (or any other diet) (3). Additionally, ramping up the protein in your diet and cutting calories alone (even if you aren’t following a ketogenic diet or you aren’t producing a ton of ketones) can improve body fat loss and help you maintain muscle. Some studies report the ketogenic diet can have beneficial effects on cardiovascular disease risk factors while others show cholesterol and blood pressure increase. Why? It depends what you were eating and what you are eating now. If your diet consisted of fried foods, French fries and alcohol and you changed it to olive oil and salmon, I’m willing to bet your triglycerides, cholesterol and blood pressure will go down. If you were eating whole grains, legumes and salmon and started eating fatty red meat, butter and coconut oil, expect your cholesterol to shoot through the roof. Aside from what you’re eating, weight loss has a huge effect on cardiovascular disease risk factors. If you are over fat and you lose a lot of weight, blood pressure, cholesterol and other cardiovascular disease risk factors will likely improve. Regardless of what you eat. A diet full of Twinkies can be beneficial for heart health risk factors as long as you lose weight. The ketogenic diet effectively reduces the incidence and severity of seizures in epileptic patients resistant to medication. Ketogenic diets are being studied as potential therapeutic remedies for those with dementia and mental disorders. However, it s too soon to recommend these diets in patients with dementia or a mental disorder (4, 5). As mentioned above, you can lose weight on this diet. If you love dietary fat, don’t like carbohydrate-rich foods and you are determined to try this diet, work with a MD and registered dietitian who are experts on ketogenic diets and have experience implementing these diets with their patients. There are many potential immediate and longer-term health consequences that may result following a ketogenic diet. These can be decreased or avoided when you follow the expert advice of a MD and RD. Who Should Avoid the Ketogenic Diet? This is not an easy diet to stick with. Anyone who is not going to take the time to plan it according to the directions of a RD (again, one who has worked with this diet; likely an outpatient RD who works with epileptic patients) should avoid trying a ketogenic diet. Also, anyone with a disease state or on medication should avoid it unless they talk to their MD first. Those with eating disorders or disordered eating, strength and power athletes as well as athletes engaged in high intensity sports should skip over ketogenic diets. There are better ways to lose fat and fuel your activity. 1 Wheless JW. History of the ketogenic diet. Epilepsia 2008;49 Suppl 8:3-5. 2 Bueno NB, de Melo IS, de Oliveira SL, da Rocha Ataide T. Very-low-carbohydrate ketogenic diet v. low-fat diet for long-term weight loss: a meta-analysis of randomised controlled trials. Br J Nutr 2013;110(7):1178-87. 3 Kosinski C, Jornayvaz FR. Effects of Ketogenic Diets on Cardiovascular Risk Factors: Evidence from Animal and Human Studies. Nutrients 2017; 9(5): 517. 4 Bostock ECS, Kirkby KC, Taylor BVM. The Current Status of the Ketogenic Diet in Psychiatry. Front Psychiatry 2017; 8: 43. 5 Gasior M, Rogawski MA, Hartmana AL. Neuroprotective and disease-modifying effects of the ketogenic diet. Behav Pharmacol 2006; 17(5-6): 431–439. 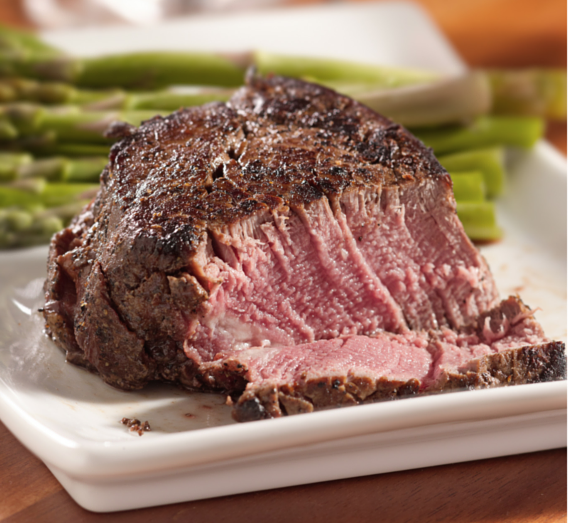 Picture this: a thick, juicy, tender eventeak grilled to perfection with melted butter glazed on top, gently dripping down the sides. Lying next to the steak there’s a side of dark green asparagus sautéed in coconut oil and dusted with a sprinkle of sea salt. Could a diet loaded with fat help you lose diet-resistant body fat that’s been taunting the seams of your dress pants and poking through buttons on your shirt? Will eating fat turn you into an all-star athlete? This is part 1 of a 2 part series on the ketogenic diet. The issue with ketogenic research studies. Is the ketogenic diet superior for losing fat? How will the ketogenic diet affect muscle? How will the ketogenic diet impact athletic performance? For nearly a century, epileptic patients have used ketogenic diets to control seizures when common medications provide no relief. Scientists aren’t sure why following a ketogenic diet decreases the incidence and severity of seizures but it works. The ketogenic diet contains – 80-90% of calories from fat, 15% from protein and 5% from carbohydrate (1, 2). Food choices may include heavy cream, bacon, eggs, non-starchy vegetables, mayonnaise and sausage while fruits, starchy vegetables, breads, pasta, cereal and other carbohydrate-rich foods are not allowed. During the first several days on a ketogenic diet, your body’s limited supply of carbohydrate stored in liver and muscle tissue decreases dramatically. As a result, you will feel like you have mono – exhausted, with headaches and easy exercise will feel like you’re climbing Mount Everest (3). Once your stored carbohydrate has dwindled, ketones, formed from the breakdown of dietary fat, become the primary source of energy for brain and body. Ketogenic means “ketone forming.” It takes at least seven days to reach nutritional ketosis and several weeks to fully adapt to the diet (12). If you aren’t in nutritional ketosis (as measured by blood, urine or breath ketones; ketone levels > 0.5 mmol/L), then you aren’t following a ketogenic diet, you are on a low carbohydrate diet. Much of the research on adverse effects comes from studies in epileptic children since they have been on the diet for long periods of time. These studies show soon after starting a ketogenic diet, blood cholesterol levels and artery stiffness increase (4, 5). High total and LDL cholesterol are risk factors for cardiovascular disease (diseases of the heart and blood vessels). When arteries are stiff, they cannot expand as well in response to changes in blood pressure. Think of this like a garden hose when you turn up the water pressure, your hose either expands or the water bursts out of the space between the faucet and the hose. When arteries cannot open widely to accommodate increases in blood flow, blood pressure increases leading to microscopic tears on artery walls, development of scar tissue and the perfect surface for plaque buildup (6). Blood cholesterol levels returned to normal in patients who went off the diet and in those who stayed on it, they returned to normal after 6 to 12 months. Artery stiffness returned to normal after 24 months on a ketogenic diet.5 Studies in obese patients suggest ketogenic diets improve blood sugar and blood cholesterol levels over time, either due to the diet, weight loss from the diet, a combination of the two or carbohydrate restriction (7, 8). Lose weight, regardless of what you eat and blood cholesterol, blood pressure, inflammation, blood sugar and many other disease risk factors will improve. Ketogenic diets are typically low in calcium, vitamin D, potassium, magnesium, folic acid and fiber. There are several potential consequences associated with consistently low intake of each of these micronutrients including softening of the bones, decreased bone density, muscle damage, muscle weakness or spasms, and abnormal heart rhythm. However, with careful planning, a fiber supplement, multivitamin and under the guidance of a physician who may prescribe potassium and sodium supplements (blood sodium could drop to dangerously low levels while on this diet), nutrient needs can be met. Also, to prevent constipation when on a ketogenic diet, a fiber supplement may be necessary along with more water / fluid intake then you are used to. Harm to your Brain. Studies in mice show a high fat diet, even when followed for as little as two months leads to chronic inflammation, sedentary immune cells in the brain – these cells typically act like janitors picking up trash and infectious compounds but when they become sedentary they stop doing their job, leading to cognitive impairment (9). Does this happen in humans and resolve over time? We don’t know. Mad Bacteria in Your Gut. A diet with no probiotics (healthy bacteria) and low in prebiotics (certain types of fiber that the healthy bacteria much on for food keeping them happy) will likely change the composition of bacteria in your gut so you have more harmful and less beneficial bacteria. Leaky Gut. High saturated fat meals increase bacterial toxins (endotoxins) in the intestines and intestinal permeability. In other words: leaky gut (10, 11). If you are on this diet, consider opting for foods lower in saturated fat and higher in unsaturated fats (liquid oils, avocado, nuts, seeds, olives). Free radicals in overdrive? If you can’t eat a number of colorful foods including blueberries, beets, corn, oranges, and more, chances are you won’t get a wide array of antioxidant compounds to quench free radicals (compounds that are important for good health but can wreck your body when they aren’t tamed by antioxidants) as well as other plant-based compounds that keep your arteries, muscles and other parts of your body healthy. Will your body adapt? We don’t know at this time. Are the side effects and potential negative side effects worth it if you can lose weight on this diet? Stay tuned for tomorrow’s post on how the ketogenic diet impacts body fat and athletic performance. 1 Freeman JM, Freeman JB, Kelly MT. The ketogenic diet: a treatment for epilepsy. 3rd ed. New York, NY: Demos Health; 2000. 2 Paoli A, Bianco A, Damiani E, Bosco G. Ketogenic Diet in Neuromuscular and Neurodegenerative Diseases. BioMed Research International 2014, Article ID 474296, 10 pages, 2014. 3 White AM, Johnston CS, Swan PD et al. Blood ketones are directly related to fatigue and perceived effort during exercise in overweight adults adhering to low-carbohydrate diets for weight loss: a pilot study. J Am Diet Assoc 2007;107(10):1792-6. 4 Tanakis M, Liuba P, Odermarsky M, Lundgren J, Hallböök T. Effects of ketogenic diet on vascular function. Eur J Paediatr Neurol 2014;18(4):489-94. 5 Coppola G, Natale F, Torino A et al. The impact of the ketogenic diet on arterial morphology and endothelial function in children and young adults with epilepsy: a case-control study. Seizure 2014;23(4):260-5. 6 Cecelja M, Chowienczyk P. Role of arterial stiffness in cardiovascular disease. JRSM Cardiovascular Disease 2012;1(4):1-10. 7 Dashti HM, Mathew TC, Hussein T, Asfar SK, Behbahani A, Khoursheed MA, Al-Sayer HM, Bo-Abbas YY, Al-Zaid NS. Long-term effects of a ketogenic diet in obese patients. Exp Clin Cardiol 2004; 9(3): 200–205. 8 Volek JS, Feinman RD. Carbohydrate restriction improves the features of Metabolic Syndrome. Metabolic Syndrome may be defined by the response to carbohydrate restriction. Nutr Metab (Lond) 2005;2:31. 9 Hao S, Dey A, Yu X, Stranahan AM. Dietary obesity reversibly induces synaptic stripping by microglia and impairs hippocampal plasticity. Brain Behav Immun 2016 Jan;51:230-9. 10 Mani V, Hollis JH, Gabler NK. Dietary oil composition differentially modulates intestinal endotoxin transport and postprandial endotoxemia. Nutr Metab (Lond) 2013; 10: 6. 11 Lam YY, Ha CW, Campbell CR, Mitchell AJ, Dinudom A, Oscarsson J, Cook DI, Hunt NH, Caterson ID, Holmes AJ, Storlien LH. Increased gut permeability and microbiota change associate with mesenteric fat inflammation and metabolic dysfunction in diet-induced obese mice. PLoS One 2012;7(3):e34233. 12 Paoli, A, Grimaldi K, D’Agostino D, Cenci L, Moro T, Bianco A, Palma A. Ketogenic diet does not affect strength performance in elite artistic gymnasts. J Int Soc Sports Nutr 2012;9:34.